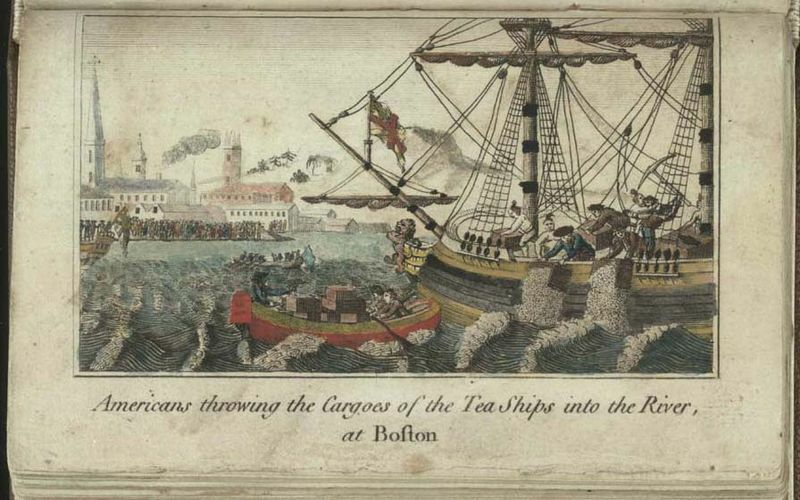 The Boston Tea Party, in a print from 1789. American colonists respond to the global policies of the British Empire. Amongst the nonsense that gets said about the British Empire (as bad as the Nazis, force for democracy… etc etc) one of the silliest statements – which you do still hear from time to time – is that it effectively invented Indian famine. Long peddled by nationalists, it’s one of those historical myths only sustained by a careful avoidance of petty inconveniences like facts. But as with many myths, there is – in fact – just a kernel of truth. The British did not create famine in nineteenth-century India, but they probably made it worse. Instead of aiding the hungry, it is argued, they wrung their hands and worried whether giving out food to the starving might simply encourage idleness. They didn’t use the phrase ‘dependency culture’, but they meant it. The ultimate origin of this policy of laissez-faire was the writing of Adam Smith, most obviously – of course – his Inquiry into the Nature and Causes of the Wealth of Nations. Such is the power of ideas that a book written by a Scottish academic was, by the nineteenth century, underpinning famine policy on the other side of the world. And such was the power of globalized imperialism. We tend to think of ours as an age of globalization, and surely it is. But it is not the first, and nor will it be the last. Step back to the 1630s, and the Deccan region of India was suffering under one of the worst famines in the subcontinent’s history – at least that we know about. Life, said the Mughal historian Kafi Khan, ‘was offered for a loaf, but none would buy; rank was to be sold for cake, but none cared for it’. The causes were, it seems, partly environmental – poor harvests brought by bad weather. Perhaps part of the blame lay with the so-called ‘Little Ice Age’, which saw temperatures in the northern hemisphere drop markedly lower than they had been in the sixteenth century. But this was a regional famine, the cause and impact remained – largely speaking – local. The idea that Europeans might play a role, or that the famine might impact on Europe itself, was fanciful. Most Indians had never even heard of Europe. If we jump forward 140 years, then another famine in another part of India revealed just how much things had changed. In 1770, the huge and wealthy province of Bengal was devastated by crop failure and pinching hunger. By some estimates a third of the population of 30 million died. Even allowing for exaggeration this is a horrendous death-toll. Astonishingly, given the distance, the famine was probably partly the fault of the British, or more properly of the English East India Company. This had taken the right to gather tax in the region after its victory at the battle of Buxar (1764), and its activities had, it is argued, severely disrupted the local agrarian economy. But it is the consequences of the famine which are most astonishing, for it had a series of effects that reverberated around the globe. It was catastrophic for the East India Company, nearly bankrupting it. But the company was too big to fail, so London intervened. One of their solutions was to prop up the Company’s creaky finances by helping it create a tea monopoly in British North America. The move was hugely unpopular with many American colonists, and fed into their gathering revolt against the homeland. It was this that led to the famous Boston Tea Party of December 1773. And, as if underline the interconnectedness of the late eighteenth-century world, the settlers’ revolt that gripped British North America – with the Tea Party one of its pivotal moments – itself created major aftershocks back in the Old World. Once it became apparent that Britain would lose the war of American Independence, as inevitably she eventually would, her old enemies piled in, hoping for a share of the spoils. But it brought them disaster, for if the colonists won the war, then Britain somehow managed to come second. The real losers were France and the Dutch. Fighting Britain, even in a war she could only be defeated in, ruined both the Dutch and French governments, and in the 1780s they both collapsed. The Dutch Republic lurched into a revolt that was only quelled by a Prussian invasion. The French state limped on, but only just, until 1789; and then it imploded. This is not to say that the Bengal Famine of 1770 caused the American or French revolutions. But it did indirectly feed into American independence. And the most important consequence of American independence was the French Revolution. For the second half of the eighteenth century was an age of astonishing global interconnectivity. Ideas, goods, and governments were being transmitted over vast distances. Slavery was displacing people across oceans, imperialism was laying claim to lands that Kings and Parliaments could barely even imagine. Lancashire was competing with India for the textile markets of Africa; Staffordshire, of all places, was locked in competition with China in the manufacture of earthenwares. And between 1756 and 1763, Europe became embroiled in its true ‘First World War’, with fighting from India to Canada linked in with a conflict in central Europe between Prussia, Britain, France, Russia and Austria. And tying everything together was European maritime strength. This was what kept the global web together. It carried trade goods from the Indies to the markets of Amsterdam, it created the need, the wealth, and the means for European states to carry their wars over to Asia and the Americas. It was this that connected the continents at the dawn of the global age.